[03:01:54] <slider> i have stpid Q and need help: i am trying to +grade to 2.2.5 on ubuntu6, but when i run the shell script, i can only get version 2.0.5, which was on the original live-CD i used. any help out there? [03:02:20] <slider> emc2.2.5 needed i meant. [03:09:37] <slider> hmm--now this is one i had not seen. i read several other similar wiki docs, i will try this. thanks! [03:09:52] <cradek> welcome, hope you get it. [04:02:09] <brent_laptop> can someone tell me how to do a simple thing like rename a directory in cvs? [04:03:22] <brent_laptop> thanks- so I'll have to email sourceforge? [04:03:45] <brent_laptop> to get them to change it I suppose? [04:03:47] <ds2> why do you want to rename it? [04:04:05] <ds2> you need to keep history or? [04:05:16] <jepler> mucking with the cvs repository directly is a bad idea. cvs doesn't support renaming, and it's best not to try these "tricks" to rename. [04:07:36] <brent_laptop> maybe I'll just forget the whole thing, and call it a lesson learned. [04:10:57] <brent_laptop> trouble is, it doesn't encourage experimenting- not on something so important. [04:11:10] <ds2> does svn offer the concept of a change list? [12:49:23] <archivist> too much beer at the fest last night! [13:34:28] <skunkworks_> jepler: good morning. [13:35:24] <jepler> so you're driving down tomorrow? [13:36:08] <skunkworks_> heh - you guys eat late. [13:52:21] <skunkworks_> jepler: we might have a minidv camera. we will look. [13:57:24] <jepler> hm interesting -- I am running 4 instances of pov on my dual-core laptop. sometimes each one gets about 50% CPU, but other times one gets 100% CPU and the other three each get 33% CPU. [14:02:09] <skunkworks_> How long did that take to render? [14:25:42] <skunkworks_> jepler had started something a while back..
[14:54:10] <skunkworks_> btw - how has the temperature been? [14:55:18] <skunkworks_> Great. It has been beautiful here also. [15:01:58] <chr0n1c> what ya growing alSMT? [15:08:15] <chr0n1c> hey would the transformer from the power supply of an old(newish) JVC tuner work for part of the pwoer supply for my HobbyCNC 4 axis board? [15:08:33] <chr0n1c> i was thinking it would work..* just haven't got around to building something..
[15:36:42] <BigJohnT> you would think with three stop buttons counting the e-stop that I would be faster than 200IPM rapid with 4 inches of travel! [17:17:53] <awallin> what's up at fest today? [17:19:25] <awallin> ok, did you run the 5-axis program that was shown as an avi yesterday? [17:19:59] <jepler> awallin: yes we have milled it, but I don't think any photos are online. [17:24:17] <awallin> is the g-code CAM generated or generated by hand or through some ball-specific code? [17:25:13] <DanielFalck> is that Stuart in front of the Mazak? [19:32:43] <alSMT> I think the fest cam has crashed cradek has not moved in a hr or two! [19:45:35] <DanielFalck> are both Mazaks in the festcam being controlled with EMC2? [19:46:02] <DanielFalck> what's controlling the one on the left? [20:07:08] <DanielFalck> how is Roland doing? [20:53:35] <chr0n1c> what was the vid link? [20:53:55] <skunkworks_> That is understandable.. What would it look like normally in the preview? 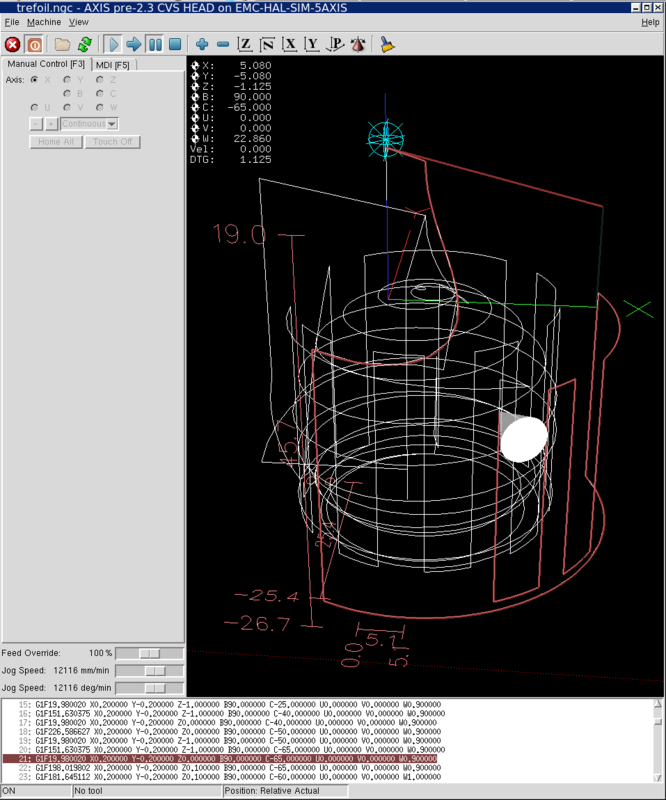 [20:57:26] <chr0n1c> awesome, gcode from povray.. which does 3d dxf right? [20:58:10] <tom1> whoa! did somebody make spherical interpolation? [21:06:34] <micges> who is the man with long black hair ? [21:08:42] <micges> jepler: with blue tshirt ? [21:09:25] <jepler> micges: It's a grey shirt but the white balance of the camera is not very good..
[21:09:40] <tom1> wah! i gotta work and the boss just gave me a 'be in detroit saturday morning'! crap! [21:10:45] <micges> jepler: what is main subject on fest? how is the progress of topics that youre planned to do ? [21:11:11] <tom1> ah! a bazillion short lines! np. the APT isnt popluar becuz people f\dont understand it , but, it can be told to cut the path into x size chunks, and will output such code for you. [21:11:57] <jepler> micges: there are a lot of different subjects going on -- everyone has his own ideas. [21:19:11] <micges> jepler: why preview of rotating is limited to only A axis ? [21:19:54] <jepler> micges: no, it's not a bug. in emc 2.2.x, preview and backplot basically ignore the rotational axes, and that is known and not likely to change. [21:20:47] <jepler> I'm working on improving that in 2.3, but exactly what that will do is up in the air. [21:22:25] <skunkworks_> ds2 - you at the fest? [21:22:46] <micges> what is difference between xyzab and xyzbc ? [21:23:33] <toastyde1th> there's no practical difference except convention. [21:24:31] <toastyde1th> note the tends, it's really however you want to set it up in the control. [21:29:25] <micges> what age is the youngest emc fest member ? [21:41:07] <alex_joni> hey chr0n1c, how goes it? [22:55:08] <tomp> well that was weird, the ps2 mouse kept selecting the session and dragging its tab ( pigeon on ubuntu/emc2 8.04) , even 'tearing' it off to a separate window. changing to a usb mouse seems to have fixed it. [23:09:23] <DanielFalck> how did Ray's classes go? [23:12:43] <rayh> Hi DanielFalck Thanks for the thoughts. [23:13:45] <rayh> That would be really great. [23:14:22] <DanielFalck> are there lots of people interested in EMC? [23:14:25] <rayh> IMO the whole EMC2 bunch is doing great stuff. [23:14:49] <DanielFalck> are you training (indoctrinating) lots of newbies? [23:14:53] <rayh> There is an amazing level of camaraderie among all of us. [23:15:15] <dmess> any machine tool reps been around?? asking questions?? [23:15:31] <rayh> We have penguins at each entrance. Once inside they are infected. [23:16:15] <rayh> I've got a dozen or so in the classes. I think things are going really well. [23:16:58] <DanielFalck> are the mach3 guys being friendly to the emc group? [23:23:03] <DanielFalck> a razor, right?